Detailed knots and filamentary ribbons of glowing gas are apparent in this Hubble Space Telescope image of Kepler's supernova remnant. 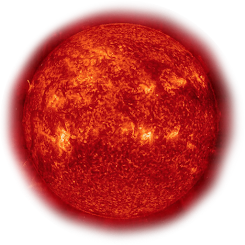 This image was taken with Hubble's Advanced Camera for Surveys (ACS) in August 2003. Filters onboard Hubble isolate visible light emitted by hydrogen, nitrogen, and oxygen in the remnant and also let through starlight from foreground and background stars. 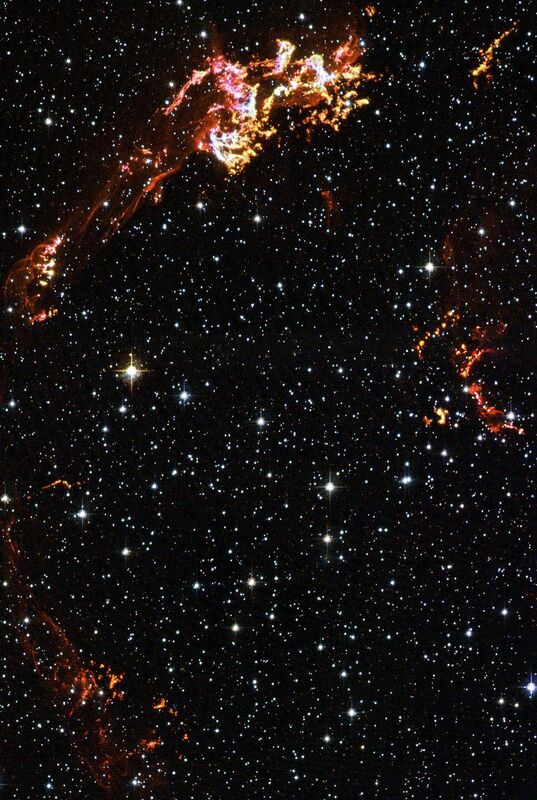 These images reveal where the supernova shock wave is slamming into dense regions of nearby gas. The bright glowing knots are dense clumps that form behind the outward moving shock wave. As the shock ploughs into material lost from the progenitor star after the initial supernova explosion, instabilities left in its wake cause the swept-up gas to fragment into clumps. The Hubble data also show thin filaments of gas. These filaments reveal where the shock wave is encountering lower-density, more uniform interstellar material.